Safyaan Mohammed Sharif (born 24 May 1991) is an English-born Scottish cricketer of Pakistani origin. Born in Huddersfield, Yorkshire, Sharif is a right-arm fast-medium bowler and a right-handed batsman. 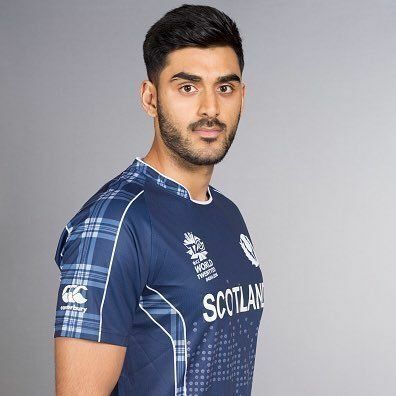 Sharif made his debut for Scotland in a One Day International against the Netherlands in the 2011-13 Intercontinental Cup One-Day competition in June 2011, taking figures of 4/27. The following month he played two further One Day International's in the tri-nation series against Ireland and Sri Lanka, with both matches played at The Grange, Edinburgh. He later made four List A appearances against English counties in the 2011 Clydesdale Bank 40. In September 2011, Sharif made his first-class debut in the 2011-13 ICC Intercontinental Cup against Namibia at the Wanderers Cricket Ground, Windhoek. Following the match he played in Scotland's two List A matches against Namibia, which formed part of the ICC Intercontinental Cup One-Day competition. During the tour, he also made four Twenty20 appearances against the hosts, taking 8 wickets at an average of 10.37, with best figures of 3/29. In February 2012, he made his second first-class appearance against the United Arab Emirates in the Intercontinental Cup. He was selected as part of Scotland's squad for the World Twenty20 Qualifier which proceeds their series against the United Arab Emirates.